On Fridays this semester, I have a six hour camera class. It's my first six hour class since in university, so leading up to it I was both excited and apprehensive. Excited, because I get to do what I love for six hours with a group of people I love, and apprehensive because, well, six hours is a long time to be stuck in class! Thankfully, my degree requires classes with more than just sitting down for lecture, and the time passes fairly quickly. Since we have to be in front of a camera, class gives me an excuse to get really dolled up for the day. I absolutely loved my outfit a couple weeks ago! It truly is the quintessential Sarah ensemble, wouldn't you say? 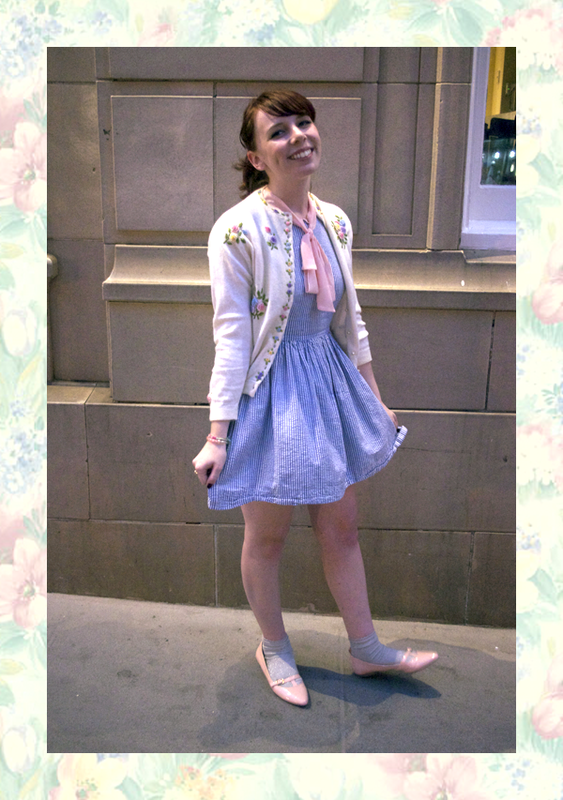 The blue dress and sparkly silver socks made me feel like Dorothy from The Wizard of Oz! Don't you just love how the perfect outfit can make your mood a billion times better? Or is that just me?